What's the thing where you're so far out the other side of culture shock that you just stop being, well, surprised? Is that really acculturation or just fatigue? Sitting with my window open. Hearing the wind moan and rush over the rooftops, the laughter of people in the square, the squeak of some window or sign's hinges, and distant motors doing who knows what (midnight renovation projects seem to be big; don't know why). Doors slam. I'm afraid of sleeping through my alarm tomorrow but that doesn't put me to sleep. There's writing to be done, and breezes to be felt. I'll say this about touring in winter: old cities don't stink. There's no post-rain cobblestone stench to rise up and remind you of the last hundred years of feces that have sunk between the stones. Or is that just France? I'm tired. I miss my husband, my cats. This chapter I'm writing is boring. Something has to change. My character has been happy for almost 300 words. That has to end. Click through for more. 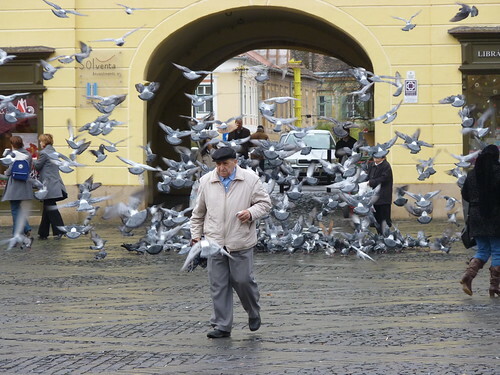 I can't promise more grumpy men, but pigeons, yes. ok, the roofs with eyes...I keep expecting the buildings to get up and walk away.